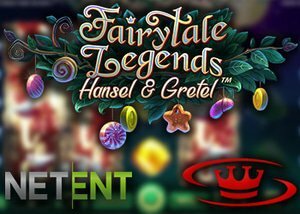 NetEnt has released a brand new slot Fairytale Legends: Hansel and Gretel and we have an exclusive no deposit bonus to offer readers. Leading software developer NetEnt has announced the release of their latest video slot and we are delighted to be able to offer readers and exclusive NetEnt no deposit bonus to test it out. This new video slot is the latest release in the Fairytale Legends series and follows on from the popular Red Riding Hood slot that has been available at NetEnt casinos for the last six month. There is always great anticipation whenever this software designer releases a new title and this new fairytale slot is no different. Fairytale Legends: Hansel and Gretel is a 5 reel title based on the classic German fairy tale of Hansel and Gretel and their battle with the witch who wants to eat them. This slot, like all NetEnt games, is packed full of great features including wilds, re-spins, free spins and more and is sure to entertain loyal fans. The game takes players deep into the woods and you must try to help Hansel and Gretel find their way to safety. The game features NetEnt's stunning graphics as well as a series of beautiful animations that bring this classic fairytale to life on your computer screen. You can view the demo version of this new slot in the video preview at the bottom of this article. NetEnt Chief Product Officer, Simon Hammon, spoke about the game's release and said, "The latest chapter in our Fairytale Legends series is another thoroughly enchanting one. With its engaging features and breath-taking design, the game demonstrates NetEnt's creative capabilities at their best. Hansel and Gretel is a fantastic follow-up to Red Riding Hood and we look forward to continuing the story later in the year - so watch this space." Casino Luck is one of our favourite NetEnt casinos and we are delighted to offer an exclusive $10 no deposit bonus to all players who sign up for a real money account using the bonus code 10GRATUIT. You can use this to play the new Fairytale Legends: Hansel and Gretel slot and many other great titles. When you make your first deposit at Casino Luck you can claim their welcome bonus which is a $150 plus 150 spins on NetEnt's Starburst slot. This is a first deposit bonus offer of 100% up to $150 plus 150 free spins. They also offer a special day 2 reload bonus of 50% up to $150 and there are regular players promotions all the time too. Casino Luck is available for all players on desktop and mobile and there are games to suit all online casino fans. If you want to play the best NetEnt games for real money and test out the new Fairytale Legends: Hansel and Gretel slot be sure to claim our exclusive NetEnt no deposit bonus today. A video preview of this new slot can be viewed below.